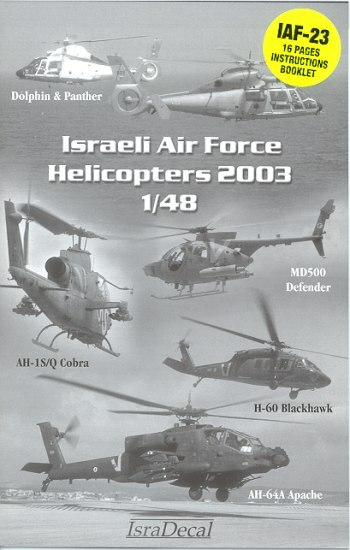 Continuing with new releases from Isradecal is this sheet on IAF helicopters. This sheet covers all the different ones in service during 2003 as well as some of the older versions, and that means quite a few aircraft. It really would be easier just to do this in a list. Most of the helos are in OD, brown, or sand, though a number of them are in a disruptive camo scheme. The quality of the decals is outstanding and they include a variety of colors and styles of markings to allow the builder to produce just about any IAF helo for which he has reference. The booklet that accompanies the sheet is superb and shows several photos of the planes in question. A detailed data and stencil placement drawing for the H-60s is provided. Frankly, this is the finest IAF helo sheet you will find in 1/48 and if you have ANY interest in modeling IAF helos, then this is the set you should seek. Review sheet courtesy of and available from various retailers around the world.